Views of the marina or the park? Take your pick from 390 spacious rooms and suites, designed for maximum comfort and equipped with every modern convenience. With 14 room types to choose from there's a space for every type of traveler, whether you're here on business, enjoying a romantic getaway or vacationing with the whole family. Offering suites for those who love a spacious stay, and executive options for those after 24-hour Club InterContinental access, InterContinental® Abu Dhabi is your perfect urban oasis. 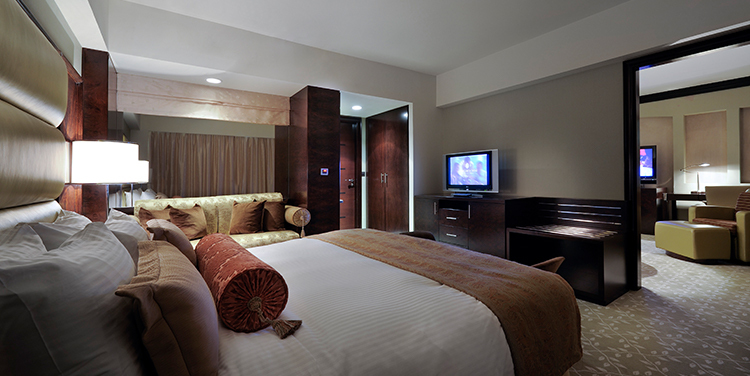 Our 390 rooms and suites provide a luxurious stay for every traveler. Each room puts an array of five-star amenities at your fingertips, with sumptuous bedding, plush furnishings, lavish extras and plenty of space to stretch out and relax in. Bathed in stunning views of the marina and park. Nearly every room has a view of the marina. After a busy day, refresh and enjoy a drink from the minibar as you relish the panoramic views. Catch up on work with fast complimentary WiFi or head to our 24-hour Club InterContinental lounge for round the clock refreshments, afternoon tea or pre-dinner cocktails. If you'd rather stay in and enjoy the comfort of your room, 24-hour room service lets you select from InterContinental Abu Dhabi's nine different restaurants and bars – perfect for a quiet night in. Introducing YOUR RATE. Members now get better savings when booking on this site. PO Box 4171, Abu Dhabi, UAE. © 2018 IHG. All rights reserved. Most hotels are independently owned and operated. Designed by QUO.